Here's a quick overview of the notable and not-so-commonly known facts about history-rich Currituck County. The name "Currituck" originated from an Indian word which meant "Land of the wild goose." Currituck was essentially settled a quick 50 years after the famed Jamestown colony, by settlers who trickled down from Virginia. The region has always been prized for its oysters. As early as the late 17th century, visitors and colonists noted that the local oysters were among the biggest and fattest they had ever seen. In 1663, settler John Harvey received 600 acres as a grant. Five years later, a huge tract of land known simply as "Carolina" was granted to eight men, known as the Lords Proprietors, who set up a government and divided this main county, Albemarle, into 4 precincts - Pasquotank, Perquimans, Chowan, and Currituck. After settlement, Currituck became prime farming territory, and the estates were huge. The average farm size ranged from 100-250 acres by the 1730s. Pig farming was one of the earliest and most popular types of farms in the mainland region, and the county is still known for pig farming today. The early 1700s also marked the establishment of an active port at the "New" Currituck Inlet in present-day Moyock. This seaport attracted tradesmen and shipping companies, but it also attracted a few notorious pirates, including Blackbeard himself, who was a rumored friend of the collector of the Currituck Customs House. Currituck was surprisingly active during the Revolutionary War. Locals provided supplies to area soldiers, and the Currituck and Camden troops helped General Skinner and Cornwallis throughout the war. The Old Currituck Jail and Historic Courthouse, both constructed in the 1700s, are two of the oldest buildings in Currituck County and coastal North Carolina. The 19th century was relatively quiet, and by the late 1800s, Currituck had developed a reputation as a rustic sportsmen's paradise. Wealthy New England and New York residents would shuttle down to the mainland and the barrier island communities to go duck hunting and fishing. After the paving and establishment of NC Highway 12 in the latter half of the 20th century, which connected Corolla with the rest of the Outer Banks, development boomed. Thousands of vacation rental homes, shops, and businesses were subsequently built in the 1980s and 1990s. Today, Currituck County welcomes hundreds of thousands of visitors to its beaches, although its historic relics, including the Whalehead in Historic Corolla, Currituck Beach Lighthouse, and historic county courthouse and jailhouse, remain some of the county's top attractions. Tracing Currituck County's history is a lengthy process, but the following timeline covers a good chunk of the region's most significant and landscape-changing events. Pre-1500s - Currituck County serves as the comfortable home for the Chowanog, Yeopin, and Poteskyte Native Americans who enjoy an abundance of fresh fish, oysters, and fertile farm lands. 1566 - Spanish explorers land on the Currituck County beaches, and the region is noted by European Explorers for the first time. Early 1700s - Currituck County's original Courthouse is constructed. 1775 - The Battle of Great Bridge- a 30 minute skirmish with the British - occurs in Currituck County. 1776 - The Colonial Legislature grants permission to build the historic Currituck Jail. 1842 - A new county courthouse is constructed, which replaces the early 1700s structure, but which currently serves as the home of Currituck's governmental administrative offices. 1859 - The Albemarle Chesapeake Waterway opens, providing a vital passage for mariners traveling from Maine to Florida. The waterway is known today as The Intracoastal Waterway. 1873 - Construction on a lighthouse, the Currituck Beach Light, begins in the northern barrier Island region of Currituck. 1875 - The Currituck Beach Light is turned on for the first time, providing a guiding beacon for mariners passing by off the coastline. Late 1800s to early 1900s - Currituck begins garnering attention as a rustic but premier destination for hunters and fishermen. Locals begin small guide service businesses, while wealthy visitors start building hunt clubs and retreats in the area. 1960s-1990s - NC Highway 12 is constructed and paved, providing an easy route to the northern Outer Banks. Development booms in the Currituck Beaches. 2000s and beyond - Currituck County remains one of the most visited counties in the state of North Carolina, thanks to its abundance of vacation homes, shops, restaurants, and attractions. There are a number of historic sites to explore in Currituck County, both on and off the beach. Be sure that these local attractions are on your list of "must-see" destinations while visiting the region. The Whalehead in Historic Corolla - Built in 1925 by Edward C. and Marie Louise Knight as a private residence, the historic Whalehead in Historic Corolla is effectively one of the first opulent vacation homes in Currituck County. Today, visitors can tour the 21,000' square foot structure, which is renowned for its authentic and striking art deco architecture. The Currituck Beach Lighthouse and Keepers House - Constructed in 1873 and completed by 1875, the Currituck Beach Lighthouse is one of the oldest lighthouses along the Outer Banks and can be seasonally climbed for a small fee. 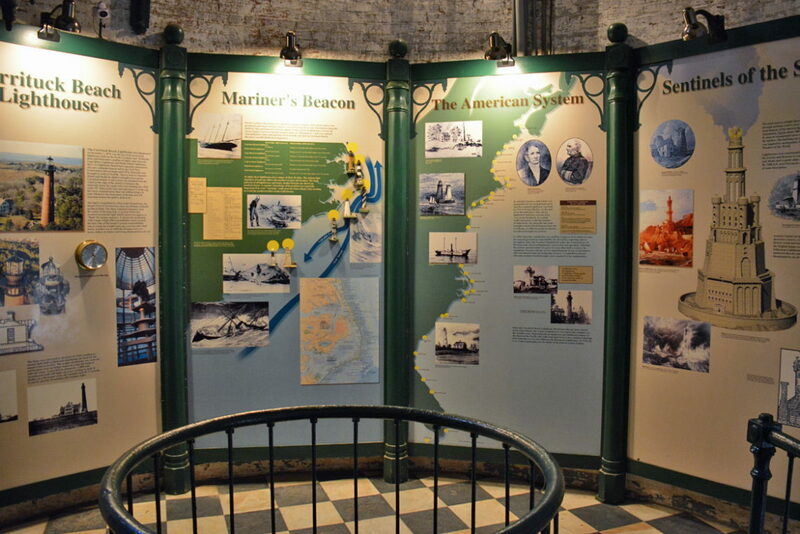 The adjacent and original Lighthouse Keepers cottage now serves as a small museum and gift shop, and features original lighthouse artifacts. Old Currituck Jail and Historic Courthouse - These two historic mainland sites, both constructed in the 1700s, are two of the oldest buildings in the state. Restoration plans are in the works to renovate the aging structures, however visitors can still admire these sites, (which are both found in the town of Currituck), while work is in progress. Corolla Schoolhouse - Built somewhere between 1890 and 1905, this small one-room schoolhouse operated until 1958 for Currituck County beach residents. The building was restored in 1999 when it was turned into a museum focused on the wild horses of the Currituck Outer Banks. Corolla Chapel - The 1885 Corolla Chapel, located on 1135 Old Corolla Village Road, is one of the oldest churches along the northern Outer Banks. Recently restored, the Corolla Chapel still holds regular inter-denominational services on Sundays.